Treatments for Leg Cramps | What Causes Leg Cramps and What Should You Do? Leg cramps can be quite uncomfortable. Some patients report waking up due to pain in their feet, thighs, and calves. Though the cramps usually come and go quickly, the effects are lasting. Many people feel tenderness in the area for up to 24 hours afterwards. The condition, sometimes called a “charley horse”, sounds harmless. In some cases, there is a more serious underlying issue. 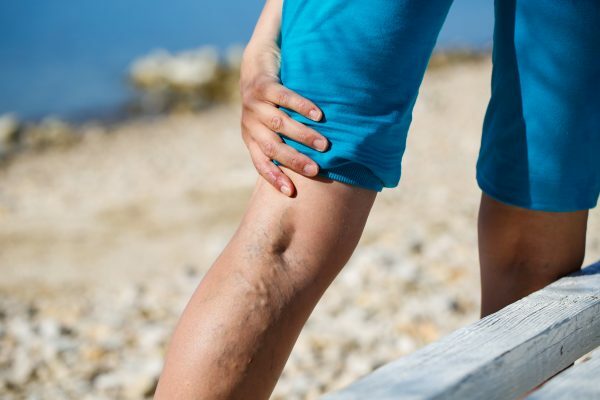 The most common cause of leg cramps in the adult population is actually circulatory issues, or venous insufficiency, which often goes undiagnosed. If you experience these symptoms, see a vein disease specialist as soon as possible. If you don’t have spider veins or varicose veins yourself, you probably know someone who does. These conditions are quite common, impacting more than 54 percent of women and 45 percent of men in the United States. Individuals age 50 and older are at greater risk of both issues. The technical term for spider veins is telangiectasias, but they are better known by their nickname because of their appearance. Spider veins look like a tiny web of red, blue, or purple veins just beneath the surface of the skin. They occur when the one-way valves that keep blood flowing in the right direction stop working. When the valves fail, blood can flow backwards in the vein. This causes an increase in pressure on the walls of affected blood vessels, which eventually weakens them. The spider veins you see near the surface of your skin are veins where blood is flowing the wrong way. Varicose veins, which are officially known as varicosities, can appear anywhere in the body. However, they are most commonly found in the legs. The veins become enlarged and twisted, and they are thicker than usual, which creates raised or swollen bulges under your skin. The risk factors for spider veins and varicose veins are quite similar. Age, family history, and obesity can all play a part. Pregnant women and women going through menopause often experience vein-related issues, as do people who spend a lot of time on their feet. The underlying cause of spider veins and varicose veins – as well as the leg cramping that results – is a condition known as Chronic Venous Insufficiency (CVI). In short, CVI refers to any situation in which your veins are unable to effectively transport blood back to your heart. In addition to the contributing factors mentioned above, CVI can be caused by blood clots, injuries or trauma to the leg, smoking, and cancer. Many people notice symptoms related to vein disease, but they attribute the symptoms to minor lifestyle habits. For example, swelling in the ankles and legs or throbbing and achiness might seem like the obvious result of a long day at work. Other missed signals include pain while standing, pain that recedes when you put your feet up, a feeling of heaviness in your legs, itchiness or weakness in your legs, discoloration of the skin around your ankles, thickening of the skin on around your ankles or legs, and ulcers on your legs. If you experience any of these, it is critical to see a specialized vein doctor to rule out CVI. If you have experienced the pain of vein disease cramps, there are a variety of minimally invasive options to get relief. Advances in technology have reduced the need for surgery, so there is very little downtime after your treatment. Your physician will review the most appropriate methods based on your specific situation, and you will have a customized treatment plan so that you can look and feel better as soon as possible. Sclerotherapy – This treatment uses a medical injection to take diseased veins out of action. Blood reroutes through other, healthier vessels. The entire process takes less than 30 minutes, and you will be back on your feet in no time at all. Vаrіthеnа – This procedure works in a similar manner to standard Sclerotherapy, with one significant difference. The medication is already pre-mixed into a foam before it is delivered to your physician. Radiofrequency Endovenous Ablation – Also known as RFA, this method relies on heat to close diseased veins. The unused tissue is gradually reabsorbed by your body, and you no longer have to worry about unsightly varicose and spider veins. RFA is usually painless, and little or no recovery time is required. Endоvеnоuѕ Laser Ablаtіоn – EVLT also removes damaged veins from circulation, but instead of a salt solution or heat, this procedure relies on laser technology. This treatment has been proven effective over time with a 97 percent success rate. The entire process is complete in under an hour, and you can go back to your normal activities within a few hours. VenaSeal – Scientists are always in search of new, more efficient treatments for medical conditions, and VenaSeal is a recent addition to the treatment of vein disease. This process uses a special type of glue to seal diseased veins. Clarivein – Some doctors and their patients prefer Clarivein to other treatment methods, because the procedure is virtually painless. If you are experiencing leg cramps or other symptoms of vein disease, it is important to see a vein disease specialist as soon as possible. Expert physicians at the Vein Treatment Center can help. Call or visit the clinic online for more information.